After a monthlong setback, from mid-May through mid-June, the loan market caught a bid during the final two weeks of last month, in part as a result of improved technical conditions. As usual, Europe was the catalyst. Encouraging news from that troubled region – first, the Greek election in mid-June that for the moment quelled worries about a eurozone exit, and then the June 29 European Council agreement to allow its European Stability Mechanism rescue fund to infuse capital directly into troubled banks – pulled investors off the sidelines. In fact, the technical situation in the loan market was in relative balance even during the late-May/early-June correction. 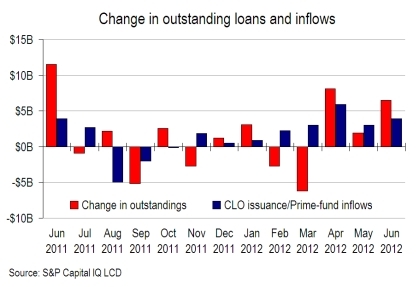 Bolstered by strong CLO activity, visible inflows during June totaled $3.9 billion, or $2.6 billion less than the amount of new loans that entered the S&P/LSTA Index during the month.